Why did blogs die? If, that is, it can even still be remembered that once they were alive. I’ve been meaning to write a blog post on this since back when they’d only been dead a year or two. I remember thinking that they had definitively died when Andrew Sullivan gave up on the monetized version of his longtime blog The Daily Dish. If anyone were going to make a financial go of blogging, it would have been him. That he couldn’t seemed final. But I suspect that the process of dying began much earlier. It seems almost too obvious to finger social media as blogging’s killer, but sometimes the obvious happens to be the case. Back when blogging still seemed comparatively healthy, I remember resenting terribly the little “Share This” buttons that all my colleagues in blogging began to place at the end of each post. There was one little button for Facebook, then another for Twitter, then another for Stumble Upon, then one for Reddit, et cetera until every post in the blogosphere seemed to be staggering under a Lilliputian colony of parasitic buttons, like an immune-compromised deer studded with ticks. The blackmail was straightforward: If you didn’t add the little buttons to your posts, then fewer people would share your posts, and fewer people come to your blog. If you did add them, however, you were giving free advertising to the big social media sites, which some day, everyone knew, were going to ingest into themselves, macrophagically, the impulse for self-expression that had once gone into blogging, where at least it seemed to have some independence. The poisoned bait of social-media traffic weakened the herd of bloggers, but it didn’t quite constitute a cull. The cull came as a reflected blow. Since the dawn of blogging, even Luddite bloggers like me had had little hit counters, where we could track how many visitors came to our site. One week—I’m sorry I can’t remember when; all I know is that it was more than a decade ago, and less than two decades ago—I watched my hit counter as the daily population of visitors to this blog drained away, steadily. Google had adjusted its algorithm, I soon discovered. Previously, when you had searched Google for, say, “gay cannibalism” or “does television impair academic performance,” the results had been ranked according to how many times your website was linked to by other websites concerned with the same topic, and this ranking had been more or less independent of time. On social media sites like Facebook and Twitter, however, the newest information was always at the top, and people seemed to prefer seeing newer content first, even if older content was more pertinent to their interest, or more rich in information and context. Under the pressure of competition, Google rejiggered its ranking, and overnight, it, too, began to discount heavily for time. A blogger who only posted a few times a month was doomed. Over the course of one fateful week, my visitors dropped away, day by day, as Google’s rankings of the pages on my blog were quietly recalculated. The crowd never returned. The same shrinking was no doubt inflicted across the blogosphere. One’s only recourse was to post more content, faster! But the sweat-shopping of oneself can only be carried so far, and the psychological costs of trying to always have the latest, hottest take probably aren’t worth bearing. It was nonetheless still possible, even after this cull, for a blogger to soldier on, less read but still not yet completely unread. In a way there was even liberation in knowing that one had lost most of one’s audience. One could at last delete the little “Share This” buttons (which I had eventually given in to) without a sense of loss. Henceforth one was writing only for the diehards, for those who were committed, like oneself, to keeping themselves carefully impervious to the latest attention-manipulating software. The few, the proud, the Web 1.0. Then came the coup de grâce: they offered to pay bloggers. People often act in ways that conventional economic theory finds hard to predict. Examples range from people, paradoxically, donating less blood when they start being paid to do so, to parents leaving their children at a daycare centre longer after fines are imposed, to firefighters starting to take more leave when financial penalties are introduced. This is referred to as “crowding out” – when an interaction becomes transactional it ceases to engage people’s finer feelings. I still haven’t quite weaned myself, as you see. I kept this blog for years, and habit is almost as powerful as economic (mis)understanding. With toothpicks and Scotch tape, I have redesigned this blog. The inciting force was a notification from my old webhost, Typepad, that I had used up my allotment of categories. Three hundred categories I had been given, and no more. I had squandered them on Elizabeth Bowen, psychoanalysis, anarchism, and habeas corpus, and if now I wanted a category for Charles Williams, tough. I sulked. I googled. And found myself gazing wistfully at the pastures over at WordPress.org, where yeomen and lasses seemed to frolic carelessly amid flocks and flocks of categories, all gamboling happily together. I seemed to hear them singing of how easy and intuitive their lives were. They idled. They drank from their flagons. They uploaded to folders with natural-language names. Hope you like the new design. If something isn’t working, let me know. In a nice way. The idea behind it is that the easiest sort of thing to read is a tall, fairly narrow column. In order to make the central column as tall as possible, there’s no banner or menu across the top of this blog. To minimize distraction, clutter has been reduced in the sidebars, and the date, category, and author of a post has been made tiny and gray. The badge in the upper-left-hand corner with the blog’s title was hand-lettered in synthetic scrimshaw by a grizzled sailor locally sourced from a wharf. At the back of my mind, during this ordeal, was the question: Why? While researching new web hosts before the transfer, I noticed, dispiritingly, that a fair number of blog redesigns are followed in short order by blog death. Redesign, in other words, seems in many cases to be a symptom of the propietor’s waning interest. Let’s prop the little monster up one more time and paint a happy face on it. Then, a week later: Let’s just shoot it. Like human civilizations, blogs do not last forever. And it turns out that while I was entrammeled in renewing the code of this one, I failed to observe its tenth anniversary. 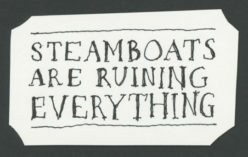 I first posted on Steamboats Are Ruining Everything on 29 March 2003. About errata, of course. Good god. The quandary: If I wanted to communicate an important discovery, shouldn’t I write it up formally, either for money (i.e., journalism) or prestige (scholarship)? If a discovery wasn’t worth these rewards, was a casual communication of it worth risking my reputation, such as it was, for accuracy and deliberation? Though I had chosen not to pursue a career in academia, I had earned a Ph.D. in 1999 and was saddled with scholarship’s neuroses as well as journalism’s. To speculate beyond one’s area of expertise, based on no more than intuition and a few pieces of evidence, which happened to be new to oneself but might not be to specialists—wasn’t that a recipe for broadcasting one’s ignorance? And at the pit of my stomach, as I contemplated my efforts to make a living as a freelancer, lay another question: Would my editors continue to buy the cow if I was dispensing the milk for free on my blog? Still good questions! Though not good enough to deter me from the pleasure of seeing myself type, evidently. I did discover a new use for a blog last year. It turns out that a blog can be a pretty good way to draw attention to a matter of urgency and public importance and to relay information about it in detail. But I have had to bench myself and let others carry that particular banner, and anyway, civic alarm is somewhat to one side of the puzzle that a blog poses to a writer. A few years ago, print magazines complicated the puzzle by starting blogs of their own. I became inveigled when editors at the Paris Review invited me to send the occasional post their way. An odd state of affairs. They were offering a little money, but so little that a writer with any economic sense would have politely declined. My trouble was that I didn’t have any economic sense and was writing these posts for nothing already. I had then recently written one about the movie Avatar, for example, that had been reprinted on n+1’s blog and quoted by Daniel Mendelsohn in the New York Review of Books. That was fun. Should I stop? Why? So I started sending posts about movies to the Paris Review from time to time. Later I sent posts about other topics, and later still, I also started sending them to the New Yorker. I can’t tell you how confusing this all is. Now, whenever I write something for my own blog, I can’t help but wonder whether I should send it somewhere else before hitting the Publish button. Pro: Cash. Con: Waiting. Am I an impatient person or a greedy one? And what if they say no? Steamboats Are Ruining Everything, after all, has always been very indulgent of me, editorially; very broad-minded. One’s amateurism has been a bit tampered with. Guilt colors one’s thinking, as guilt usually does when writing and money meet. One ought to be selling one’s wares for as much as the market will bear if it is in good faith that one has declared to the IRS year after year that writing is a profession not a hobby. In which spirit, of course, one should probably not be writing blog posts at all. But one can’t let capitalism have all the fun. Four months from now, Penguin will publish my first novel. Friends congratulate me that I already have a “web presence.” I do intend to exploit it, but I’m haunted by a koan that a fellow writer once shared with me: “Freelancing only leads to more freelancing.” What if web presence only leads to more web presence? It probably isn’t for nothing that the sale technicians of the internet, when referring to a website reader’s decision to make a purchase, use the heavy and difficult word conversion. Is blogging no more than a thing-in-itself? Am I about to quit? For the tenth anniversary of Steamboats Are Ruining Everything, here’s to ambiguity. Here’s to going down with the ship. I review James Lasdun’s Give Me Everything You Have: On Being Stalked in the 4 March 2013 issue of The Nation.